Individual packing of cups and glasses for moving is an annoying task to do, but it’s a safe method to preserve your valuables intact. The easiest way is using a cell pack with cardboard dividers, as it can provide extra protection for your glassware. But in this case you also have to wrap each item individually first. If not using cellular dividers, a small to medium sized box should fit the case. Be sure to tape its bottom side to ensure your belongings won’t drop off. Put some wadded newsprint paper or peanuts on the bottom for cushion. Then, sort glasses, cups and mugs which are of similar size, so that they can nest inside each other. 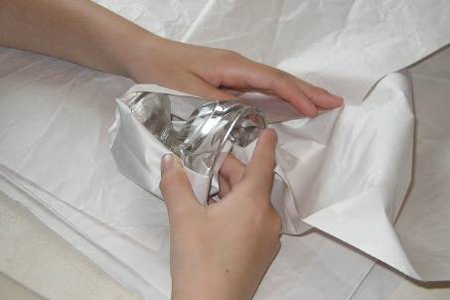 Wrap two sheets of packing paper around each item individually and nest the items one into another. If there’s enough space in the box, you can nest three to four glasses, depending on their size and weight. Once it’s filled, top off the box with rolled up newspaper or bubble wrap to secure the fragile content. Seal the box well and put a label on it saying “Fragile – Cups/Glasses”. You could ask at the nearest wine store or your mover for some divided boxes to use. Do not over pack boxes and fill empty spaces with wadded newsprint or bubble wrap to prevent shifting. If you pack various items in the same box, you should place glasses and stemware on top. This entry was posted in Packing tips on August 20, 2014 by Izzy Removals.